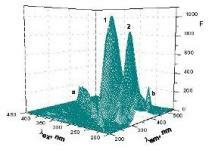 The binding of cis-[Pt(DMSO)2Cl2] to bovine serum albumin (BSA) at physiologically relevant conditions has been studied by fluorescence spectroscopy methods. It was proved that the fluorescence quenching of BSA by cis-[Pt(DMSO)2Cl2] is mainly the result of the cis-[Pt(DMSO)2Cl2]-BSA complex formation. Binding of cis-[Pt(DMSO) 2Cl2] to BSA causes conformational changes that result in exposure of the previously shielded Trp residue. The modified Stern-Volmer quenching constant Ka and the corresponding thermodynamic parameters at different temperatures (298, 303 and 308K) revealed that cis-[Pt(DMSO) 2Cl2] could be bound to BSA through van der Waals interactions. According to the Föster`s non-radiation fluorescence energy transfer theory the binding locality distance was determined at various temperatures. The 3D fluorescence measurements demonstrated that binding of cis-[Pt(DMSO)2Cl2] to BSA induces a loss of helical stability of polypeptide strands of protein and microenvironment polarity changes of Trp residues.